Sweet strawberries mixed with vanilla ice cream. That drums up images of trips to the berry patch and making homemade ice cream in the bucket. We have an electric ice cream maker and strawberry is one of my favorite flavors so this should be interesting. This is one of their many flavors and promises to be something special. I wanted to find out more about the company but wasn’t able to find much online. Their website has a little back story about where the name came from, which is nice and gives a little history of the founder, Charlie, as a kid. The idea of the chalk dust comes from a chalkboard that his father would write their restaurant’s daily specials on. The dust would settle on the top of a bell that sat next to it. I would have liked to discover where the company is headquartered, what their mission is, and how they approach making their e-liquids. Unfortunately, I was not able to find any of this on the website or their Facebook page. As a kid, ice cream to me came in buckets with strawberry, vanilla, and chocolate. 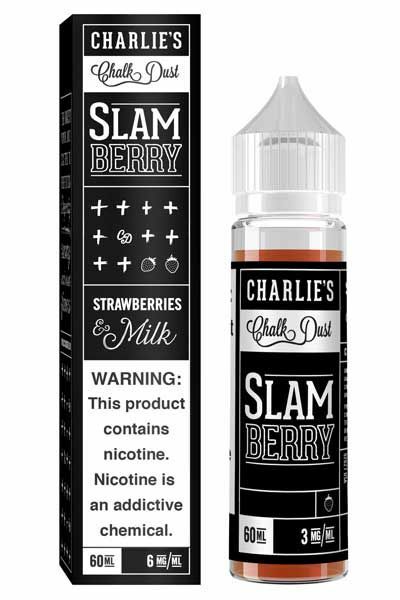 I have been a fan of strawberry ice cream for a long time so when I read the description for this e-liquid, I was pumped. Many flavors like this claim to have an “ice cream” type flavor, but in truth few actually do. I really like the design on the bottle. It’s the “black label” series with white lettering. It’s a very nice-looking label and comes in a glass bottle with dropper. I have seen two different designs for this series, one in black bottles with gold and purple. And the other with the clear glass bottles with the white label and artistic imaging on the front. Both are very stylish and eye-catching. I think the black is meant to be more intense and exclusive. I think they designed these bottles to appeal to different types of shoppers and apparently, this works well for both designs. I got the 15 mil bottle for $13 in 6 mg strength for testing on my RDA. I am testing it on my Reuleaux 200W mod with my Dead Rabbit RDA at 60W. I usually like to test new flavors on my RDA first and then in one of my tanks to see if the flavor changes any with more restricted airflow. When I open the bottle I get a scent of strawberry and cream. It is light and smells almost like opening a jar of strawberry jam. I put a few drops on my freshly-wicked Dead Rabbit and hit the fire button. Oh, this is really good. It doesn’t taste like jam or have that artificial sweetener flavor ( or should say the undertones of artificial sweetener). On the inhale, I get the strawberry flavor followed by a creamy flavor on the exhale. There is no real ice cream flavor I can detect, but it is very good. The flavor is nice and is something I could use as an all-day vape. I was really hoping this would be more like a real ice cream flavor but it is closer to a strawberry milk or maybe milkshake in my opinion. It is very tasty, and I like it. I was expecting something different and it’s kind of a let-down. But as a flavor, it is really good and if you like strawberry milk you’ll love this one. This flavor is actually very similar to another e-liquid brand but I think the flavor in this one is a little bit better. The formulations for these bottles is 60VG/40PG so it does make some really nice clouds. It is probably more suited for tanks at 40PG but for testing purposes, it works. I got some really nice cloud production and fogged up the room after about 5 good hits with the airflow all the way open. I also used this in my Uforce tank and got some pretty nice vapor from it there as well. The flavor was still good but not as pronounced as it is on the RDA. Still very good on both atomizers for flavor and vapor. –The 60 ml bottle is priced at $19.99 which is a good value for such a big bottle. It is priced in the same range as other premium e-liquids of the same size. I purchased a smaller bottle for testing, but the larger one is a better value. I don’t mind paying more for e-liquids that really suit me. It is hard to find some flavors that you really like and when you do you should stock up on it. Everyone’s taste buds are different so it’s always a good idea to try new flavors, whether you end up liking them or not. Your tastes will change over time and you’ll find more flavors you enjoy. Some vapers often pick up on flavors that others don’t. If you don’t taste a certain flavor come back and try it again later. Your ability to taste certain flavors is determined by many factors and if you happen to be sick or have a stuffy nose, it can affect your sense of taste. I have had a bit of a cold the past few days so it could be affecting my ability to taste certain flavors. All in all, I like it. It has a good flavor, makes good vapor, and it’s priced affordably so If I was in the market for a strawberry milk I would buy this one. Although it didn’t taste like ice cream to me, I still enjoyed it and will use the rest of the bottle. I may even buy a larger bottle because it is really a good-tasting juice. I definitely recommend it to vapers who like strawberries and cream flavors. Homemade E-Liquid – Is Selling It a Good Idea? our Specialized Ranking System and Reviews will help you find the the best new gear.